Organic pink lentils, sprouted, and added to soup. Great minds must think alike; the day after I picked up some of these pink lentils from the bulk section of our local health food store, a package came in the mail with the same lentils from my Mama, all the way from Andy's Produce in California. They are pretty, though, don't you think? 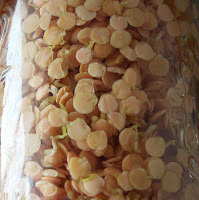 Sprouted the same way I sprouted buckwheat, just rinsing a couple times a day in a mason jar with a screen for a lid. I added them to soup, made with chicken broth, moist sea salt, and avocado added in the last few minutes of cooking. 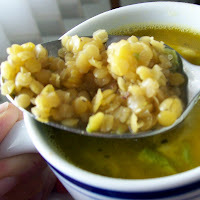 0 Response to "Sprouted Pink Lentils (In Soup)"